Today is the last day of CNY, here wishing all Chinese a Happy 元宵節 yuan siu jet (in Cantonese) or Tzap Goh Meh (in Hokkien). Most families will celebrate the ending of the New Year with a feast. Some people also called today the Lantern Festival day, most families will display and play with beautiful lanterns (mainly paper and bamboo lanterns), and lantern processions everywhere, a jolly happy evening especially for children. Where I am in England with this miserable cold and snowy weather and the quietness about the whole New Year’s celebration this is not going to happen. 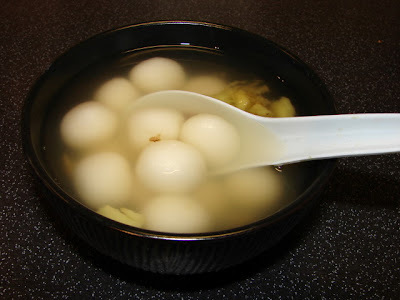 Also significant today is making and eating sticky rice balls (dumplings) or 湯圓 (Tang Yuan). Chinese love these sticky rice dumplings, we eat them several occasions in the year like this last day of CNY, on Winter Solstice Festival day 冬至(about a week or so before CNY) and on weddings. Sweet ones are most popular because they are sweet, sticky and rounded to symbolise life is sweet, family/newlywed will stay harmonious and sweet together and a good, smooth and rounded ending to CNY. I had made some yesterday will make some more today. I love them. There are so many ways and recipes for these sticky rice dumplings. I will share some of these recipes with you. The dough for these dumplings, either boiled or deep fried is identical, except for savoury a touch of salt is add, for sweet dumplings some sugar may be added. Per 100g of dried glutinous rice flour use about 85 – 90 mil(gram) or water. Mix till the dough is smooth and looks like a piece of plasticine and feels quite soft but not sticky, if it is sticky add more flour if too dry and crumbly add a few more drops of water. Take a chunk of this dough roll into a sausage and cut/break into equal parts and roll between you palms to form a ball and spread it out into a disc if you wrap it with filling. If you add sugar to the dough add a touch less water. This savoury version is lovely to serve as lunch. It’s meat balls wrapped with this sticky rice dough. Mix the dough as mentioned above with a touch of salt to taste. I used about 125 -150g dried flour to make about 15 of these dumplings about 3cm wide. 2 to 2-1/2 cup of homemade chicken or pork stock, if not available use about 1 heap tsp of chicken granules like Knorr and hot water. Small handful of chopped spring onion. Enough light soy or salt to taste if the stock is not seasoned. About 250g of ready made dough with a touch of salt to taste. Pot of fresh boiling water to boil the dumpling balls. Mix the pork with the rest of the ingredients, make into meatballs about 2 cm wide. Leave in the fridge for at least 30 minutes to set, you can make them well in advance if you want to. Roll out the dough into balls about the same size as the meat balls. Get ready with the soup base to ensure it is heated and boiling before the dumpling balls are cooked. Add seasonings and wine to taste, leave ginger, spring onion, sesame oil for later. Before you start making the dumpling balls, boil a large pan of water. Spread each dough ball into a disc with the centre slightly thicker than the edge and wrap the meat around it. Tease the dough with your fingers and roll between you palms till you get a nice rounded and evenly spread dough around the meat ball. Don’t worry if the dough breaks or not even, just patch it up with some extra dough, this dough is very easy to patch up. Pop into a pan or boiling water straight away if you can, if not the dough could stick onto the tray you placed it on and break the dough. Let the dumpling balls boil till they float to the top and continue boiling for another minute or two. 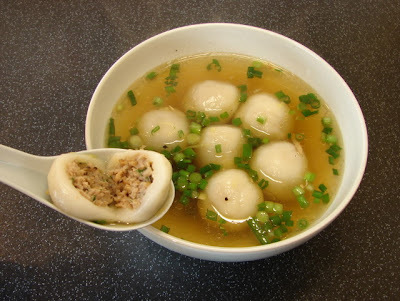 Pop dumpling balls into serving bowls, sprinkle with enough ginger, spring onion, sesame oil to taste. This is the most common Cantonese style (or in my family anyway) sticky rice dumplings. I had these few times a year since I was a kid. Very easy to make. My mum used to ground her own rice to make the dough. Some people in the far east will dye the dough pink (red) as red is the colour of luck. Make the dough as I mentioned earlier with a little less water and some caster sugar to taste. I normally use about 2 tbsp of sugar to 100g of dried flour. Make the syrup by bashing a thumb size piece of ginger, add this to about 2 to 2-1/2 cups of water and add enough sugar to taste, bring this to a boil and simmer gently for about 10 minutes. Before rolling the balls, boil a pan of fresh water. To make the sticky rice dumplings, roll the dough into a sausage cut/break into equal parts and roll each between you palms to a ball about 1-1/2 to 2 cm wide. Pop the balls into boiling water soon as they are made and cook till they float onto the top and continue boiling for another 30 sec – 1 minute, take them out and pop into the hot sugar syrup. When you have made enough, divide into bowls and serve hot, warm or even cold. Or you take the balls out and coat them with a mixture of non-salted roasted peanut finely ground, dry roasted sesame seeds and caster sugar. 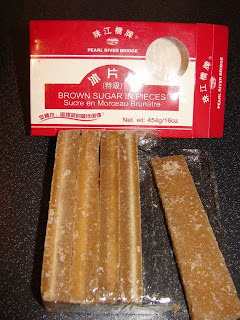 If you have a very sweet tooth you can wrap this dumpling with a small piece (about 5 - 7m cube) of Chinese brown sugar like this below. The lump of sugar will melt once the dumplings are cooked and you get molten sugar syrup oozing out when you bite into the dumplings. Yum! Thank you, thank you, thank you! I've had the sweet version on my mind for a while and I'll be making it soon thanks to you!